H.R.H. Grand Duke Henri of Luxembourg, Kt.HRE. H.R.H. 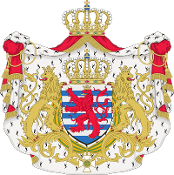 Grand Duchess Maria Teresa of Luxembourg. H.R.H. Prince Guillaume of Luxembourg, Kt.HRE. Hereditary Grand Duke of Luxembourg. H.R.H. Prince Félix of Luxembourg, Kt.HRE. H.R.H. Prince Louis of Luxembourg, Kt.HRE. H.R.H. Prince Sébastien of Luxembourg, Kt.HRE. H.R.H. Princess Alexandra of Luxembourg.